After years of observation and analysis, researchers announced today that they have identified liquid water on Mars — a ton of it. It’s a mile underground and is likely only liquid because it is briny and under great pressure, but nevertheless, this groundbreaking discovery could change both our understanding of the Red Planet and our plans to one day go there ourselves. The discovery was made by Italian researchers from a variety of institutions, led by Roberto Orosei at the Istituto Nazionale di Astrofisica in Bologna; the paper describing their work detecting and characterizing the water was published today in the journal Science. How did they do it? 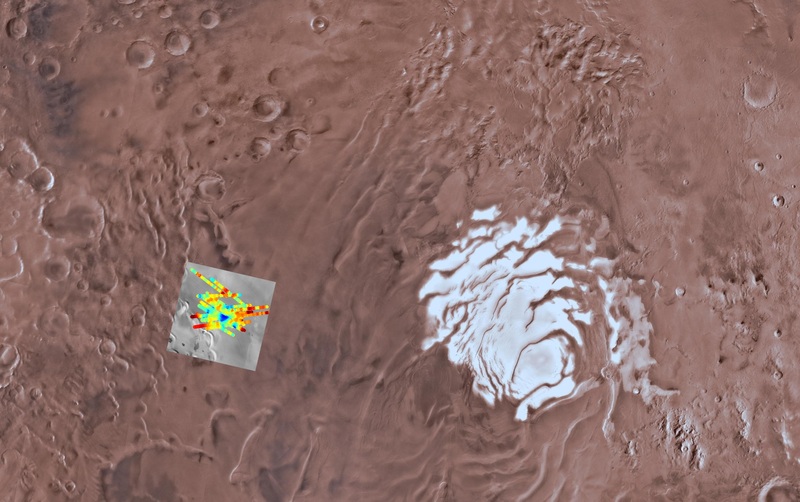 The study used data from the Mars Advanced Radar for Subsurface and Ionosphere Sounding, or MARSIS, aboard the European Space Agency’s Mars Express Orbiter. 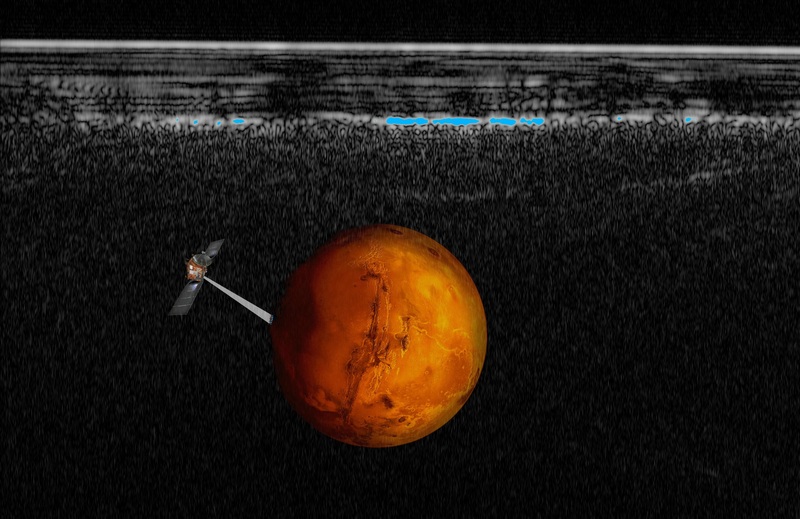 It’s a ground penetrating radar that has already contributed to the story of water on Mars, with its readings suggesting basins and other features indicating oceans once existed there. 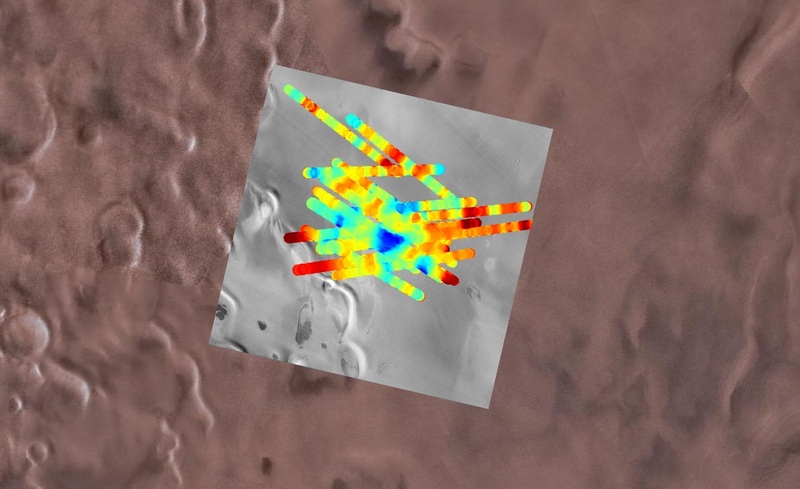 The researchers looked at data from 2012 and 2015 covering an area of Mars adjacent to its geographic south pole. Although this area “does not exhibit any peculiar characteristics,” as the paper puts it, it has been theorized for decades that the polar ice caps may hide liquid water deposits. This theory, advanced most prominently by Stephen Clifford in 1987, proposes that not only would surface ice insulate inner layers from the sub-freezing surface temperatures, but that the pressure exerted by those millions of tons of ice and rock would substantially lower the melting point of water so that it remains liquid even at several degrees below zero Celsius. In addition, minerals mixed into the water and making it briny can further lower its melting point, and these minerals or salts (sodium, magnesium, and calcium) are known to exist in Martian soil. But whether the conditions necessary for such liquids to form and remain are actually present on the planet in our time has been a matter of debate for decades — debate that today’s findings finally settle. Radar readings from MARSIS including the anomalous ones observed in Planum Australe. The top line is the surface, with lower layers correspondingly lower on the diagram. In a supplementary text they detail the work they did to eliminate other possibilities, primarily layers of CO2 or pure water ice. These options required “very specific and unlikely physical conditions” or simply wouldn’t produce the type of reflection they had seen, they wrote. The area of Mars investigated by the team; the lines indicate MARSIS radar passes; the deep blue is the strong echoes identified as water. “We found, in fact, that any other explanation for these very strong echoes was not really tenable in the light of the evidence that we had available,” Orosei said. The watery area in question is about 20 kilometers in diameter, and while depth can’t be determined, the deposit would likely have to be at least a meter thick to produce the reflection observed. So at a bare minimum we’re probably looking at a serious quantity of water, on the order of millions of liters. Close-up of the area in question – blue indicates the reflections from the lake. It’s not anything you’d want to swim in — negative 80 degrees Fahrenheit, or negative 60 Celsius, and probably more of a thick sludge subsiding here and there into “brine pools.” If I’m not mistaken you’d probably also be crushed like a bug if you weren’t inside some kind of pressure vessel. Still — it’s liquid water. On Mars. Today. Not only that, but the researchers suggest this water may not even be that unusual. MARSIS is a broad surveying instrument, not a precise scanner, and this area was spotted because it’s such a huge deposit. The large size required for a meltwater patch to be detectable by MARSIS (several kilometers in diameter and several tens of centimeters in thickness) limit the possibility of identifying small bodies of liquid water or the existence of any hydraulic connection between them. Because of this, there is no reason to conclude that the presence of subsurface water on Mars is limited to a single location. In other words, there could be ponds and rivers all over the place and we wouldn’t be able to see them — at least, not with MARSIS. We’ll need something more precise. What does this say about the possibility of life on Mars? Well, liquid water seems to be the one thing that all forms of life that we know of require in some form or another. So finding it on Mars satisfies that major requirement. Orosei and his team have no official input on the question, but he did say that the Martian lake could be similar to certain environments on Earth where extremophile single-cell life is known to exist. Again, however, whether such a form of life existed in the past on Mars or is currently at large is not a question we can answer right now. Indeed, we can’t even be 100 percent sure that it is liquid water until we send a robot to bore through the ice and test it directly — but it’s safe to say that we’re about as sure as we can get today that there is in fact water on Mars. Future missions may focus on this area and probe more closely, or observe the rest of the planet systematically to locate similar watery deposits.